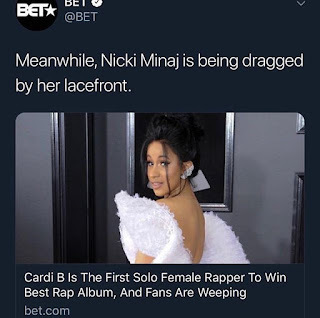 After the just concluded Grammy awards where Cardi B won a Grammy for best rap album, Black Entertainment Television (BET) posted an offensive message on social media about Nicki Minaj. The post compared Cardi and Nicki and Nicki Minaj has since pulled out of the awards with her team. However BET has issued a statement, apologizing to the rapper. This shade might just have been over board already as Nicki was highly disrespected and we doubt she will be a part of the BET awards again.